A few weeks ago I was in Hobart with my sister and niece staying at the fabulous Apartments on Star, in Sandy Bay. It was Monday afternoon when we arrived and had planned to visit MONA the next day, however the lovely Martin and Tony (owners of these gorgeous apartments), bravely told me that it’s not open on Tuesdays. I started hyperventilating – visiting MONA was a priority to me. While my head was figuring out how the heck I could get there ASAP, the wonderful Tony whipped out his iPad, checked the ferry schedule and explained that if I left immediately I could catch the next ferry and have at least a few hours at the museum. I flew into hyper drive, grabbed my coat and purse and was directed by my personal tour guide toward Sandy Bay Road and the wharf. Mine hosts assured me that if I liked a good coffee then I could always stop at Jackman & McCross for a yummy latte… my heart froze for an instant – a latte or MONA? I decided the café would have to wait until breakfast the next day – I was on a mission to MONA, no time for self-indulgence. I ended up catching the bus to MONA as the ferry was leaving a half hour later – I sat up front chomping at the bit like a nun on her way to communion. The bus driver and I chatted about this and that before I somehow let it slip that my boys in California were avid Laker fans. This man knew more about the NBA than most fans in the USA. He spoke proudly of LeBron James, Dwight Howard and Kobe, lingering on the sad demise of the Los Angeles Lakers this past season. Even on this bus, in freaking Hobart –‘the natural gateway to east Antarctica’- the Lakers haunt me. 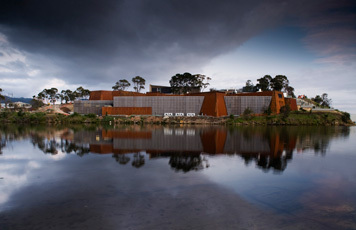 The first thing about Mona that captivated me was the striking location. The Museum and accommodations sit on the edge of the Derwent River and all around, natural, earthy colors beckoned me closer, I half expected fairies and garden gnomes to greet me at the tennis court. Raw, primal hues follow through to the interior of the museum reflecting an elemental feel, coupling art and architecture. I walked directly down to the lowest floor and stared at the rocks – then I took photos of the rocks and the staircase, before I even began exploring the art. My heart began to race, not from excitement, but from the realization that I was underground; my slight fear of claustrophobia reminded me it was lingering in my veins. Deciding that I’d better get moving, I bravely took a few steps toward the first piece – from then, there was no turning back. Mona entrapped me for two and a half solid hours, sadly not nearly enough time to experience everything to be offered but the ferry beckoned. Once on board, I looked around at my fellow sailing companions and it dawned on me that perhaps some of MONA’s most enthralling art works were right here, in front of me, on the ferry. Was this part of the museum, I wondered – pure genius – ladies dressed in tight black narrow legged pants with tight black boots and fur-trimmed coats – that’s real fur, not pretend. And the mastery behind the ugly, oversized jewelry that dripped from the hands and necks of the women was spectacular, but not to be outdone by the makeup that was so desperately doing its best to hide crow’s feet and laughter lines. This was performance art at its best. One of the actresses spoke – her voice just the perfect volume to be heard over the artsy voices of the other actors – she taunted that her new-best-sailing-friend sitting demurely by her side, ‘simply must see the next exhibition to show in Melbourne – it will be simply marvelous,’ she sighed. These people were good – they had me fooled for a bit, a perfect way to finish the tour. Bravo. During my time in Hobart, Mr. Tuffin and I had decided to actually meet in person at Grape in Salamanca. Adorned in his black spandex bike-riding gear, sipping on champagne while navigating around a tablet, Lindsay and I quickly struck up conversations about art, family, and worldly adventures. Our waitress was wonderful, and made perhaps the best lemon, lime and bitters I’ve ever had – I witnessed her create it – none of this bottle crap. She squeezed fresh lemons and limes and drenched the glass with bitters – it was exceptional. I froze my buns the whole time I was in Tasmania; north, south, east and west – face it, Taswegians, it’s cold all over the state, except for Deloraine. As my mother said when I drove her out there one day, ‘God knows why your brother lives out here, it’s the coldest place in the whole state.’ I agree – it was a little nippy. Staring out at the Sydney Opera House from my hotel room window, I’m missing Tasy already. My waistline is telling me it’s time to get back home to sunny California so I can eat salads and there are no veggie rolls or French vanilla slices to tempt me. As I sat in a café somewhere in The Rocks area this afternoon, Cyndi Lauper drifted over the speakers singing True Colors – yes, dear Cyndi, these are my true colors – sipping a latte, taking notes and snapping random photos with a foot in two countries that I call home. Half way through drinking my coffee I see words written on the inside of my cup, they read – ‘Sharing the Passion.’ Ah –ha, it’s synchronicity once again. I was having difficulty deciding whether to order a hedgehog slice or a piece of mango-passion-fruit cake, but now I know what it’s to be.